JMT Architecture’s Philadelphia, Pennsylvania Studio hosted 12 ACE Mentor Program participants on Wednesday, December 19, 2018. As part of the ACE program, Architect Ashley Spinrad, AIA, NCARB, led a session titled, “How Do You Become an Architect?” The session concluded with a hands-on exercise of creating scale drawings of the conference room. “This workshop is a great opportunity to introduce students to the field of architecture. Selecting a career path as a high school student can be a daunting task. ACE provides a unique and valuable setting for students to learn directly from professionals what it really is we do before making this important decision. I am honored to be a part of that process,“ said Spinrad. This event was the second session at JMT that focuses on Architecture. 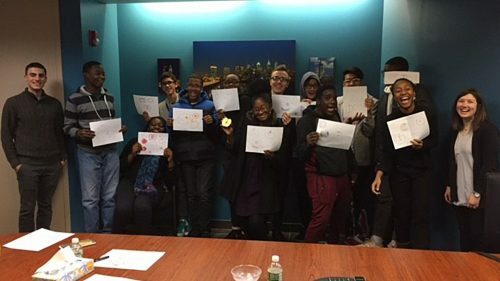 On Wednesday, December 12, 2018, students participated in a “What Do Architects Do?” session and completed drawings of an apple in plan, section, and elevation. Other activities at JMT Philadelphia included topics related to water resources, aviation, civil engineering, and highways. JMT ACE participants come from the Science Leadership Academy, a magnet public high school in Center City. The participants are all sophomores. ACE – which stands for Architecture, Construction, and Engineering – mentors high school students and inspires them to pursue related careers. Spinrad has been involved with ACE for four years, with this being her second year participating with JMT. Including the December sessions, Spinrad and others in the Philadelphia office completed 6 sessions over the past 3 months. They expect to host another 10 sessions in the 2018-2019 school year. JMT Architect Dave Recchia, AIA, is also an active ACE volunteer in the Baltimore, Maryland, area.